ADDITIONAL RETRACTION of claim Coltrane got Rudnick to rewrite Walkup’s report on Archives release. 4/20/2015: The original title of this post was Klinger says archivists “resigned”, Coltrane got Rudnick to rewrite Walkup’s report on Archives release, no followup from Coltrane on deleted docs. As explained below, on 4/3/2015 I retracted my statement that Interim President Coltrane got Sharon Rudnick to rewrite Amanda Walkup’s report on the Archives release, in response to an email from Coltrane. In response to the demands for retraction I have received from Mr. William F. Gary of HLGR, posted below and here, I am also retracting my statement that Ms Rudnick rewrote Ms Walkup’s report. My statement was not factually supported, I retract it, and I regret publishing it. 4/3/2015: The original title of this post was Klinger says archivists “resigned”, Coltrane got Rudnick to rewrite Walkup’s report on Archives release, no followup from Coltrane on deleted docs. As explained below, I am retracting the claim that Interim President Coltrane got Sharon Rudnick to rewrite Walkup’s report on the Archives release.My statement was not factually supported, I retract it, and I regret publishing it. On March 26 Bill Gary of the HLGR law firm, which Scott Coltrane has inexplicably left in charge of UO’s legal affairs, demanded that I retract the claim that Interim President Coltrane got Sharon Rudnick to rewrite Walkup’s report on the Archives release. See below for the link to Rudnick’s summary of the report, and the retraction demand and back and forth here. Apparently Gary is OK with this post on a potential conflict of interest between HLGR’s OUS billings and Gary and Rudnick’s work on the release of Randy Geller’s memo on dissolving the Senate. Thank you for calling my attention to recent posts you have made on your blog in which you have claimed that “Coltrane got Rudnick to rewrite Amanda Walkup’s report on Archives release”. You ask whether Mr. Gary represents me in connection with a comment he posted on your blog. Mr. Gary does not represent me. Nor do I see anything in his comments suggesting that he does. However, now that I have seen the fabrications that you have posted, I am beginning to wonder whether I should ask him to represent me. Let me be clear: I did not ask Sharon Rudnick to rewrite Amanda Walkup’s report and Sharon Rudnick did not do so. Posting false and defamatory comments of this kind can do great damage, not only to those you defame, but also to the university. I join Mr. Gary in asking that you retract these false statements. This is especially true at this time when we are trying to rebuild trust in shared governance. In regards to your efforts to improve trust in shared governance, I agree these have been significant. However, UO’s Public Records Office is still using delays, fees and redactions to prevent the release of public records. I don’t think that there is going to much of an increase in trust in the Johnson Hall administration, by the UO Community, reporters, or the state at large, until you address that problem. 3/25/2015: And Library Dean Adriene Lim wants $210 to reveal docs on prior reviews of archives. Meanwhile, no follow through on promises from Coltrane or Library Dean Lim to the UO Senate that they would look into larger problems with UO’s transparency and refusal to provide public records, or explain what happened to the documents on athletic subsidies and the Knight Arena – and so much more – that are missing from the digital presidential archives. OSU Libraries treat patron information as strictly confidential to the extent permitted by law. It is generally for the use of library staff only; it can, of course, be divulged to the patron. Unless required by law, patron information is not to be given to non-library individuals, including parents, friends, professors, university administrators, police, FBI, university security staff, or the CIA. The university librarian is responsible for compliance with legal obligations and court orders. UO economics professor Bill Harbaugh got the records from the archives and he returned them in late January at the request of the UO administration. Harbaugh is publisher of the insider uomatters.com blog. The administration’s role in the departure of the archivists is “despicable,” he said. The archivists were just doing their job when they provided the documents, Harbaugh said. They required Harbaugh to agree to the library’s standard disclaimer, which warns researchers that archives may contain sensitive or confidential information that may be protected by privacy laws and other regulations. It warns the researcher that releasing private information without consent could have legal ramifications. Archivists abide by a professional obligation to balance access to public records with confidentiality, Harbaugh said. “People don’t go into this kind of work without believing in the importance of access. They’re researchers, they’re historians, they use these kinds of records to do their own scholarly work. They know it’s important that this material be maintained and made accessible. I’m really proud of them. They did their job,” he said. Thank you for allowing me to attend your meeting today. I don’t know what you’ve been told about how I got the digital Presidential Archives, but there was nothing nefarious about it. I sent the special collections reference desk a request for information on how to access the digital archives. I was told that the digital archives might contain confidential documents protected by FERPA or other laws, and that if I agreed not to release those documents, I should send in a usb key and I would get the archives. [Here’s the disclaimer language: Archival material may contain materials with sensitive or confidential information that is protected under federal and/or state right to privacy laws and other regulations. I agreed to this condition. I sent in the usb key. I got the documents back. I kept the confidential documents confidential, as I had promised. It strikes me that this is exactly the procedure that Andrew explained today should have been followed by the archives. It was followed. So, what is this controversy all about? I only posted two documents. No one has made a credible case for either being confidential. One, of course, was very embarrassing to the General Counsel’s office, and, in my opinion, that’s why the UO administration went after me, and the archivists. 2) permanent records, which are accessioned and housed in the University Archives. In each category, records may be further designated as exempt from public disclosure under Oregon’s Public Records Act, or non-exempt and therefore subject to disclosure. Permanent Records: Permanent records have historical significance and are designated for permanent retention according to the Records Retention Schedule. When records are no longer active (e.g., in regular use by the originating department), stewardship is transferred to the University Archives. Once accessioned by the Archives, records are processed, described in finding aids, and made available in perpetuity for research and other purposes. In most (but not all) cases, permanent archival records are non-exempt, and once processed, are available to researchers without need for further review or redaction. Non-Permanent Records: Stewardship of non-permanent records is retained by the originating department. Records are retained for various lengths of time as required by the Secretary of State’s Records Retention Schedule. Pursuant to the public records law, non-permanent records are categorized as exempt or non-exempt from public disclosure. For example, “faculty records” are considered exempt from disclosure. Non-permanent records are not accessioned by the University Archives, and the library is not authorized to determine if or when to release these records. The library offers a limited long-term storage program for inactive non-permanent records, but this is a strictly custodial role. Non-permanent records in storage remain accessible only to authorized staff from the originating department, or to the Public Records Office in response to research requests. • On November 13, 2014, a faculty member sent an email to the Special Collections and University Archives (SCUA) reference desk asking for a list or catalog showing what sort of information is available in the Library Archives regarding presidential papers, and information about how to go about accessing them. • Those records had been transferred to the Libraries by the Office of the President, but permanent and non-permanent records had not been separated based on an exception granted to the unit by the Libraries, and the permanent records had not yet been processed and described — a necessary step before documents are made available in response to such a request. • In response to the email, approximately 25,000 un-processed electronic records relating to past and current UO presidents were provided to the faculty member on a USB drive on December 3, 2014. • The records included both permanent (i.e. archival) and non-permanent records, including student and faculty records designated confidential by federal law, state law, or both, privileged communications, and documents that are exempt from disclosure under the Public Records law. • The University learned of the release of the records and its scope in early January, 2015. • The University contacted the faculty member who received the records in November 2014, and this individual ultimately returned the records on January 28, 2015 for appropriate processing. • The University sorted the records and organized them according to university policy and procedures— mainly sorting permanent records from non-permanent records. • With the initial review and organizing of the documents complete, the University is creating a special team to review and redact information that would be protected under state and federal law so the records can be available through the appropriate channels. This process will take an additional 500 hours. • Once this work is complete, the University will make all appropriate records available to those who have made public records requests for them. Permanent records will be processed by UO Archives and stored in the University’s Archives. Non-permanent records will be retained according to the Secretary of State’s retention schedule. • The records were released to the faculty member prior to the customary separation and processing required by UO Libraries, University of Oregon, State of Oregon, and federal policies, procedures, and statutes. • Records released included information, including student names and addresses, which are protected under state and federal law (FERPA and HIPAA). • The records were returned, and appropriate review and processing is being expedited by the University to ensure full compliance with rules, code of ethics, and all federal and state laws. Tagged Adriene Lim, Bill Gary, Defamation, HLGR ethics complaint, Randy Geller, Randy Geller General Counsel, Sharon Rudnick, Tobin Klinger, UO Presidential Archives. Bookmark the permalink. 75 Responses to ADDITIONAL RETRACTION of claim Coltrane got Rudnick to rewrite Walkup’s report on Archives release. Part of that timeline doesn’t make sense. It says the faculty member received the usb on Dec. 3rd, but later says the faculty member received the files in November 2014……?? The whole f’ing thing doesn’t make sense. I’ve read it three times already, and I still can’t find the part where it says the archivists (or anyone else) did anything wrong. Note also the extensive use of the passive voice and the odd vagueness about the details of whatever the “correct” procedure should have been. Sharon left her metadata on her report. What a fool. Presumably she thought Klinger would be smart enough to convert it to a pdf before attaching it to his press release. Here’s hoping the archivists got a decent fraction of the $940K Gottfredson got for signing his NDA. Just tell me. What happened to James Fox? Yes. What happened to James Fox? So far this sounds like a travesty. These guys are making the Gott look good. Pretty obvious there are documents in the archives that should see the light of day. There’s a huge difference between permanent and non-permanent records. What’s strange is that they were all released together and covering such a big time span. The warning to researchers about not disclosing confidential information is a safety net, and the primary responsibility for review lies with the archivists, not the users. I’m confused that you keep citing OSU policies about privacy when they don’t apply to Uo, any more than PSUs or EOUs do. I think the main concern isn’t what was in the digital presidential archives, it’s what the president’s office removed. I’m citing the OSU policies because they seem like a good model for what UO should have. Osu removes or flags the non permanent files via their schedule before they even go into the archives. That’s where the problem is. These shouldn’t have been transferred to the library before they were reviewed. The library doesn’t have the capacity to do all the processing themselves. The archivists made a bad decision, but the UO needs to invest in making the procedure viable for everyone to do their job. If you have a smoking gun, then please share it. Because it sounds like most of the records are either innocuous or private, and you’re the one making this bigger than it needs to be. Perhaps you could redirect your focus towards a practical matter: spearheading and publicizing a crowdfunding effort to support the unemployed archivists. After all, this very blog is probably going to make it harder for them to find new jobs. Then, while you’re using your bully pulpit to ensure that James and Kira can pay the rent, the Library can have some time and space to sort out better records management procedures. I agree, you didn’t build the bus Bill, but you certainly drove it over those two archivists. Rally your fan club and personality cult to get those two new jobs. As an economist, your accusation that I have a personality is professionally damaging. I demand an immediate retraction. oh, you have one, and it dominates this blog over professionalism and reason. The claim has always been that the librarians “unlawfully” released data that were “confidential”, with ominous references to FERPA, HIPAA, and faculty personnel records. What the library colleagues did was not unlawful, malicious, or a policy violation. It was done in consideration of and compliance with the professional standards of their field. It is appalling to me that they are being scapegoated. Another truly sad day for the UO: only 3 months into 2015 the UO may be nearing a record for bad decisions made in a calendar year. Does anyone know what a “faculty record” is and under what law it would be exempt from disclosure? When I tried to get the resumes of the lawyers in the UO GC’s office, Doug Park told me they were faculty, and resumes were exempt from disclosure under the PR law. I petitioned that to the Lane County DA, Perlow said that if Coltrane said they were faculty she wouldn’t order the documents released. Was Perlow really applying this to resumes, or is there some other applicable law? Can we start a petition to defend these librarians/protest their ouster? Or what other action can be taken? isn’t in private practice — she’d make Coltrane pay dearly. You are blaming the release of records on Coltrane and Lim? THEY threw the archivists under the bus? What about Bill Harbaugh? And exactly how would Martha Walters make “Coltrane pay dearly”? The University of Oregon: the President’s emails are private, but your counseling records are not. I do not know Kira Homo, but have worked with James Fox for a long time. He has been one of the hardest-working, most professional, and most widely admired employees at this University. I am sickened by this firing. It’s evident to me that he got caught in the crossfire between UO lawyers and Bill Harbaugh and, as many have pointed out, is unjustly being made a scapegoat, although he did nothing wrong. This decision cannot be allowed to stand. I will sign Gina’s petition, but that is not enough. Used to be the UO would only cut down campus trees during spring break. This is absolutely despicable. I would check with James and Kira before you start a petition. There is more to this story (rather their story) than you all seem to know. Petitions can be short sighted too. Agreed. I don’t think we are getting the full version. Ombud just finished a report on James’ work as head, but admin isn’t going to pony that up any time soon. I have learned that when someone won’t explain a questionable decision but tells me to trust them, it’s time to be very, very afraid. I wonder whether the excellent Bruce MacAllister regrets taking this job yet. I don’t see how an ombud can function independently and effectively in this repressive environment. Not a petition. A letter of protest and support that faculty may sign. And thanks for suggesting consulting with the librarians–I had already put out my query to them. It looks like the Oregonian has picked up the story too: http://sn.im/29sttj5. So the UO is a place where the director of the counseling center gets to give away a student’s confidential therapy records (despite her clear duties based on her professional ethics code) and keep her job but librarians giving away information (consistent with their clear professional ethics code) get fired. We have not been allowed much information regarding the “incident” due to “personnel issues”. And, while I understand why this is the case, it has kept the situation and the administration’s response, um, rather opaque to ULC members. Having worked with the librarians and Dean Lim, I trust that they have tried to deal with the situation thoughtfully and professionally, but now that the personnel issues are becoming public, we can hopefully get answers to some of our long-standing questions. More importantly, from my point of view, is the determination of what role the ULC should play in dealing with such incidents, and under what circumstances we should be consulted. They are not the only ones fired. JH is cleaning house. Your statement that the University President “got Rudnick to rewrite Walkup’s report on Archives release” is false and defamatory. Ms. Walkup’s report, which has not been released to the public, is the work product of Hershner Hunter alone. Ms. Rudnick did not edit the report, let alone rewrite it. You have no basis to claim otherwise. The document that you identify as the report is not the Walkup report. It does not purport to be the Walkup report and it has not been represented as such. Your claim that Ms. Rudnick rewrote an investigative report because “JH didn’t like what Walkup had to say” unfairly impugns her integrity and her professional reputation. Please retract and correct your false statement immediately. Then why is her metadata there? so, the way copy and paste works is that when you paste something into a new document, it uses your metadata instead of the original author’s. So then document was edited by the person whose metadata is present? You guys are losing me on this thread. Please explain. you guys are funny. Walkup sends her report to Rudnick. Rudnick opens a new word document and copies and pastes from the Walkup report that which can be shared publicly and saves it. That new document is then given to blogger who thinks he has the whole Walkup report and deduces that Rudnick wrote it because it has her meta data on it. If you sleuths would dig a little harder you would also find in the metadata that the document was created yesterday, just before dinner time. Because the summary of an investigation isn’t the full investigation itself, perhaps. UOM copy-pasted a recap of sorts sent to media organizations. Not the entire Hershner Hunter investigation, if I’m following right. 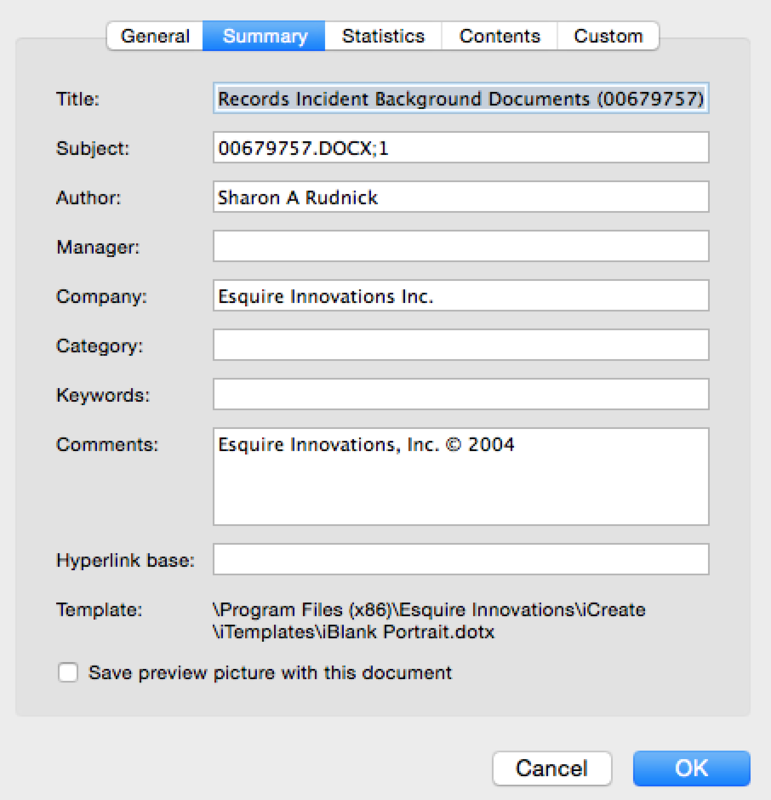 Follow the link, you can download the original Word document, and get the metadata as shown. It shows it was written by HLGR’s Sharon Rudnick, or at least on her computer. It seems to be, as you say, a summary of Amanda Walkup’s investigation report. How accurate a summary? Perhaps Mr. Gary will elaborate, in his forthcoming letter. OK, how about this: Sharon Rudnick wrote an “outline” of Amanda Walkup’s investigative report, but it consisted entirely of regurgitating the same vague insinuations that the university has been peddling all along. Instead of asking Amanda Walkup to provide a summary of her report to be released to the press, Rudnick’s watered-down, content-free document was used instead because JH didn’t like what Walkup had to say. The electronic forms of Microsoft Word files contain hidden data and extraneous information to the actual text, such as the authors of the document, deleted text, and drafting history. When these files are shared outside of the firm there is a high risk of unintentional disclosure of private information (metadata risk) that may be adverse to client representation or extremely embarrassing. I’m pretty sure Bill Gary knows the law and the rules. This nonsense about our not knowing the “full version” is pure obfuscation. Having talked extensively with one of the librarians, I assure you that this person feels wronged and appreciates our protests and support. James Fox went out of his way to help me with my research when I was a grad student and has been a great colleague since then. I’m really sad about this. So, the demand for retraction: Who is “William F. Gary” and whom does he supposedly represent? And who thinks that unverified comment on a blog is the proper format for a legal demand? How many terrible, embarrassing and downright bad decisions must be made by the interim provost and interim president before the faculty, staff and students collectively say “I’m mad as hell and I’m not going to take it anymore!” (with a nod to Peter Finch). It has become clear that our administrators are covering their collective asses at the expense of our institutional reputation and the people who work here. We have the power to get rid of them through a vote of no confidence in the Senate. Isn’t it time we take control of our university? Enough is enough. Let’s do it spring term and take our chances with the next president who will be on notice to start listening to people who make this place run. Bill: Still wondering, even assuming that Gary the commenter is Gary the lawyer. Who does he claim was defamed? Walkup (which would be the proper antecedent to the “her” in “impugns her integrity”? Or Rudnick? I hope his legal pleadings are clearer. It’s from Bill Gary. (Unless someone broke into his william.f.gary@harrang.com email address.) Presumably he’ll cool off by morning. Express a concern or make your thoughts about a work related matter known and you get fired? Sounds like some old fashioned retaliation to me. I suppose we will see UofO embroiled in yet another employee whistle blower lawsuit shortly. I just don’t get how so many seemingly educated people can get so much so wrong so many times. It really is baffling to me. Is UofO cursed? Will UA bargain for tenure for librarians now? Deb Carver convinced everyone a couple of years ago that librarians shouldn’t be tenured like instructional faculty, but perhaps in our current climate tenure would be a good idea. Will Bill Gary threaten to sue the Emerald too? It wouldn’t be the first time. Really? Please email me what you know about previous threats from Gary or others at HLGR. uomatters at gmail. Both the senate and president’s task forces established that the handling of sexual assault/harassment at the U of O is one of total incompetence, with periodic dishonesty. Yet nothing is done about the two people most responsible, Penny Daugherty and Robin Holmes. But when our librarians are seen as misbehaving–fire them! To me, this pretty much sums up the problems with the clowns running this place. Yes, that headline was a bit over the top. Good for you for admitting your mistake. Maybe Coltrane will now follow your lead and retract his claim that the archivists released the archives unlawfully? I’d like to see that too. I’d also like to see an explanation of why HGLR was involved at all with reporting the results of the Hershner Hunter investigation and why Amanda Walkup’s original report hasn’t been made public yet. So Scott Coltrane didn’t tell Sharon Rudnick to write that summary of the archives investigation? She thought of that herself, and did it pro bono? I suppose Doug Park commissioned Sharon to write the summary. DF used to hide behind his GC whenever. It’s presidential behavior. While Coltrane denies telling Rudnick to rewrite the report, he does not explain why or on whose behalf Rudnick wrote the summary report. Bizarre and petty. I think you should have first asked Bill Gary to either (1) confirm that what Rudnick’s wrote had absolutely no basis in the HH report, or (2) get him to supply a more fitting verb for “rewrote” that he feels better describes whatever relationship it did have to that report. All in the interest of accurately representing HLGR’s actions in your retraction, just as Mr. Gary insists. From my rudimentary reading of this and news articles, it appears that someone thought that if the public records office wouldn’t provide records to their satisfaction then they would prey upon others and ask them to do something knowing that it would be against university policy. Said someone got “lucky” and the others provided information that they shouldn’t have. If this was a police officer propositioning a prostitute some might consider it to be entrapment and that the officer was the person in the wrong and prostitute was an innocent victim. I don’t think we can be sympathetic to both parties in this situation. There are in fact at least three distinct sets of actors here, and it is certainly possible to be sympathetic to two of them. UO, of course, would prefer that you chose between Fox and Harbaugh and disregard their role in this mess. Both the UO Library and the Public Records Office are perfectly legitimate ways to access UO’s public records. (In fact, prior to the creation of the PRO, the Library was the only official access point.) Although it may not have been a good idea, the Library is historically the designated custodian of unsorted and unredacted presidential archives, and it was consistent with Library policy for UO faculty to have access to the raw archive after agreeing to some confidentiality conditions. In particular, in releasing the archive nobody “entrapped” anybody because nobody did anything they weren’t supposed to do under existing policy. Since the archive was released to a UO professor, it also seems unlikely that there was anything “unlawful” about his being in possession of FERPA-protected or “privileged” records. (The allegation that there were genuine HIPAA-protected records strikes me as dubious, but I don’t know what’s in the archive.) Whether the professor violated the confidentiality conditions by later posting some of these documents on the internet is a separate issue and has no bearing on the question of whether there had been any sort of “breach” in releasing the archives in the first place. The University has been trying to spin their own alarmist and punitive actions as an inevitable and conscientious response intended to protect student privacy. In light of UO’s other recent actions regarding student privacy, I’ll leave it to you to decide who’s being disingenuous here.